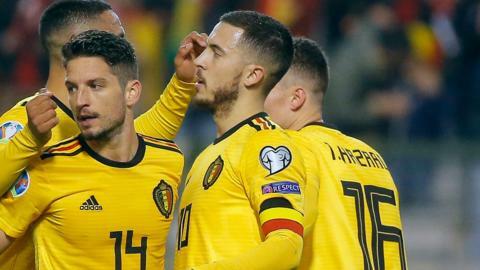 Chelsea's Eden Hazard scores twice to spare the blushes of former club-mate Thibaut Courtois as Belgium defeat Euro 2020 qualification rivals Russia. An aid to Russian president Vladimir Putin condemns Pavel Pogrebnyak after he said it was "laughable" to have a black player in the Russian national team. Manchester City forward Leroy Sane scores his first international goal as Germany beat Russia 3-0 in an international friendly. Two Russia internationals under investigation over an attack in Moscow should face severe punishment, says the Russian Premier League. Is it OK to support Team Russia? Read more on Is it OK to support Team Russia? BBC Sport joins a group of Russia fans in Sochi as their team suffer a dramatic quarter-final exit to Croatia after a tense penalty shootout. How did Russia celebrate a famous World Cup win over Spain? BBC Sport's Patrick Jennings found out watching from a bar in Samara. Roy Hodgson's England, Russia's sporting future and Uefa's decision-making all face 48 hours of scrutiny, reports Dan Roan. Wire taps, denials and lawyers - the disputed report into World Cup bidding leaves Fifa a long way from "closure". Read more on Fifa corruption report - what now? Who is playing? How can you watch? Who will win? Everything you need on day 15 of the 2014 Fifa World Cup. Who is playing? How can you watch? Who will win? Everything you need on day 11 of the 2014 Fifa World Cup. Who is playing? How can you watch the games? Who will win? All the information you need on day six of the World Cup.